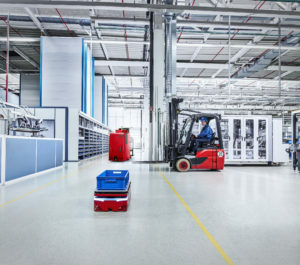 Industry 4.0 – and with it the demands for customized flexible intralogistics solutions – is being increasingly implemented within the Courier, Express, and Parcel (CEP) industry. Autonomous guided carts and tuggers prove to be efficient add-ons and alternatives to traditional material flow and sorter systems. 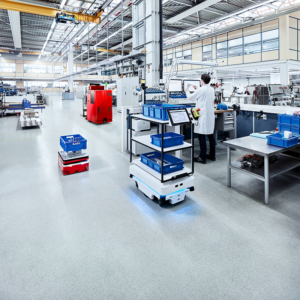 SICK offers its modular Eco-System for AGCs – with sensor solutions that make autonomous vehicles safe and efficient tools for enhanced intralogistical productivity. Flexible logistical processes in CEP distribution centers require transportation techniques that can be adapted for the particular tasks – also in terms of their sensor and control system technology. The aim is to exploit intelligent self-organizing vehicle fleets that meet the growing need for flexibility, and thus efficiently network internal material flows in production and logistical processes. Whether localization, personal safety, collision prevention or load handling – the modular Eco-System from SICK makes complete sensor solutions possible for all kinds of mobile platforms – offering maximum economic efficiency, functional reliability, and future-proofed investments. Conveying and sorting systems at CEP sites are mainly designed for objects with clearly defined dimensions. But the variety of goods to be handled has grown considerably with the boom in e-commerce. Furniture, tires, bikes, and other items are so large in shape and volume that they need specialintralogistical handling. Self-driving tuggers – as recently implemented in an American distribution hub – are a smart solution for handling such items automatically. The efficiency of the entire goods handling system in the hub increases significantly because workers are relieved from heavy and monotonous transportation tasks, and available for high-value skilled tasks. As the autonomous tuggers and personnel in the warehouse work side-by-side, the AGCs are equipped with state-of-the-art safety technology from SICK. Their localization capabilities are also “made by SICK” – all provided as a turnkey solution that offers flexible adaptability to both the current and future needs at individual sorting facilities. Sensors and control units can be adapted to create customer- and application-specific solutions for mobile material flow technologies. The entire Eco-System offers a variety of solution approaches for tasks involving personal safety, localization and collision prevention, as well as for the handling and identification of transport loads. 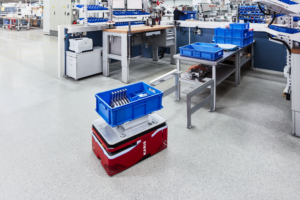 SICK’s portfolio for smart mobile automation merges the company’s long-term experience in AGV and AGC applications with its intelligent sensor technologies and broad knowledge of CEP processes. The variety of solutions for vehicle guidance (e.g. optical and magnetic line detection or grid localization via data matrix codes) combined with the wide range of safety-certified scanners, sensors and control components for 2D, 3D and 360° vehicle protection prove the flexibility of SICK sensor solution packages. Other sensor solutions allow the automatic handling and identification of pallets, mesh boxes and other loading aids. Thus goods in tuggers or AGCs remain within the closed IT cycle of the operation and can be tracked and traced at all times. Intelligent sensors also provide diagnostic functions – allowing optimized maintenance routines and the prevention of AGC failures, increasing vehicle availability as well as hub productivity. In addition to the flexible, individual arrangement of a solution, the SICK Eco-System also minimizes its complexity. All components are coordinated with one another, interfaces are harmonized, and everything is available from a single source – reliably minimizing integration and functional risks. Moreover, the information from a variety of sensors can be transferred to higher-ranking control systems in the form of pre-processed raw data – simplifying their integration in a customer-specific control environment. Finally, the Eco-System is also designed to integrate the mobile material flow solution of the CEP warehouse in the cloud. SICK underlines its solution competence throughout the entire process chain of internal transport tasks at CEP sorting hubs, distribution centers and production logistics with its modular Eco-System offering individual configuration, as well as its complete sensor solutions for mobile platforms and autonomous tuggers.